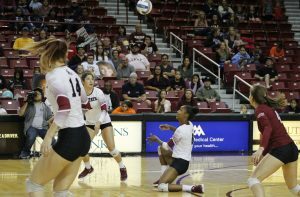 The NMSU volleyball team won its last home match of the season 3–0 against the Seattle University Redhawks on Saturday. The Aggies remain in sole possession of first place in the Western Athletic Conference (WAC) standings. “We knew [the match] would be a challenge. Seattle does some things really well — they’re a big, tall team, they serve it really well, and have a couple of really good attackers,” said Aggie head coach Mike Jordan. The Aggies’ (19–7, 10–2), victory against the Redhawks (9–16, 5–7) extends their current win streak to eight and their home win streak to 13. The first set started strong with the Aggies quickly taking a 3–0 lead. The Redhawks were able to catch up quickly and for most of the set the teams stayed within three points of each other until the Aggies clinched a win at 25–22. 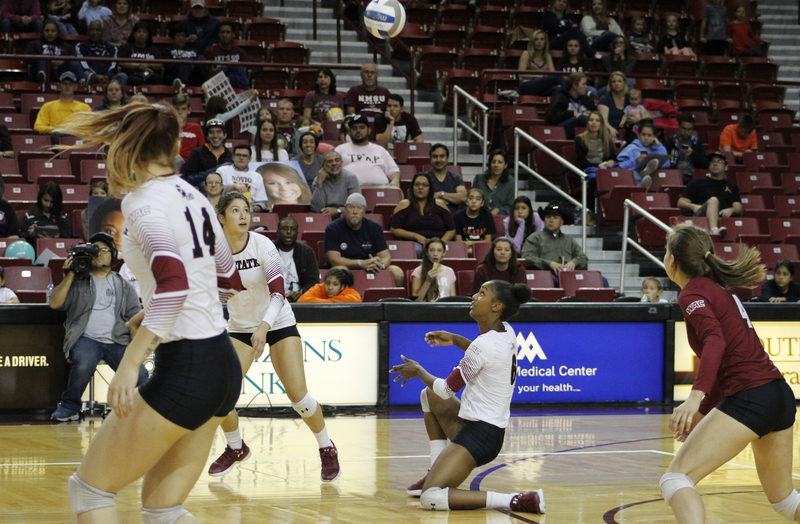 The second set started with the same back and forth, but soon the Aggies gained a solid lead, which they maintained to the end of the set with a 25–13 win. In the third set the Aggies were also able to maintain a lead through most of it, but the Redhawks worked hard to keep it close. The Aggies earned the match with a 25–19 victory in the final set. “I thought Tatyanna Battle did a great job. I thought our middles Megan Hart and Lia Mosher did a great job of setting up and putting balls away for us,” said middle blocker Sasha Lee Thomas. Battle, an outside hitter who was named WAC volleyball Player of the Week for the week of Oct. 30–Nov. 5, led in kills and aces with 14 and 3 respectively, and also got 3 blocks and 10 digs. Mosher had 10 kills and 3 blocks, while Hart got 4 kills, an ace, and 4 blocks. Jordan agreed the performance of the middles played a big role. “Our outside hitters are always really solid, they get a lot of the props, but I think our middles in particular were a big key today,” Jordan said. In addition to being the last home match, it was senior day for the Aggies. After the match, the five graduating volleyball team members were honored. Thomas, a graduating senior, spoke to the emotion of it. “I’ve been here for five years, so I never thought this day would ever come. It’s really emotional and I’m just ready to continue with my life,” Thomas said. Jordan Abalos, an outside hitter and graduating senior, was unable to play in her final home match due to an injury. “It was bittersweet, but I was glad that I could still experience it with my fellow seniors. They did great and I’m so glad to be a part of it. I’m so glad to be a part of their cheer section,” Abalos said. Jordan seemed pleased with the team’s performance so far this season despite injuries. “Any time you lose three starters to injuries that’s difficult to overcome. This group’s doing that and learning to play in a different way, so that’s been satisfying in a lot of ways,” Jordan said. The Aggies now only have two matches left in the regular season.